If you are a foreign national or an expatriate UK citizen wishing to invest in property in England or Wales, our international property investment solicitors can help you. The UK commercial property market is renowned worldwide for offering strong investment potential. Whilst values can go up or down, the UK commercial market may represent a safe option in which capital is relatively secure and a rental income may be forthcoming. If you are considering investing in UK, England or Wales commercial or residential property, you will need a UK solicitor or lawyer to advise you and represent you in your dealings with the property developers and their solicitors. Our property law team handle hundreds of conveyancing transactions each month, and have dealt with many different types of commercial transaction. Your international property solicitor is skilled in handling all different types of transaction, including purchases, sales, lease agreements and other legal issues arising when dealing with UK commercial property as an investment. We have assisted and represented clients from all parts of the World, both UK nationals and investors from overseas. We have also bought and sold property for British ex-pat clients resident in the United States, Canada, Australia, New Zealand, and other European countries such as France, Germany, Belgium and Sweden. 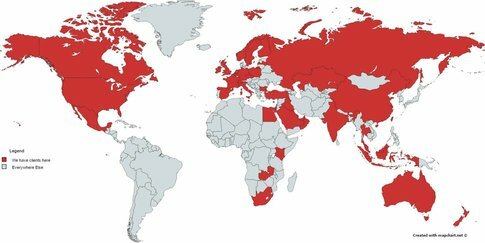 Our full list of clients worldwide is huge… this map shows where we have clients. As long as you have an internet connection we can help you, wherever you are based.There is no need for you to come to the UK to meet us. Of course, we can assist and advise in relation to any type of English or Welsh property investment. If you would like to purchase or invest in UK real estate or commercial property and do not have a particular development scheme in mind, we may be able to introduce you to a suitable property agent who can locate the right property for you. If you have found or been introduced to a particular property or development, we can help there too. All you need to do is tell your property agent and developer that you would like to instruct Bird & Co Solicitors to represent you, and we can handle it from there. We are more than happy to discuss the details informally prior to instruction, whether with you, your agent (if they can prove they have your authority) or the representative of the developer. This can be done by Skype if necessary. Our international property investment solicitor team has dealt with many different types of transaction, including purchases and leases of hotel rooms, international student accommodation, UK residential property, and commercial property such as leases of office blocks, serviced apartments etc. If you are a high net worth individual bulk purchasing units or buying entire blocks or floors of a development we can help there too. We routinely handle transactions worth millions of pounds all over the UK. Do I need to travel to the UK to visit my international property investment solicitor? No, there is no need to come to the UK to visit your solicitor, and we recognise that this would not normally be possible or convenient (though of course if you would like to, we would be delighted to meet wherever is best for you, whether at our offices, or somewhere in London or elsewhere). In the vast majority of cases, the necessary documents can be emailed to us, and we can write to you by email too. When it comes to advising you and signing the contractual documentation, we can usually deal with this by Skype. Your international property investment solicitor will arrange a convenient time for us to discuss your transaction. You will see your lawyer and we will see you, and be able to witness your signature of any documents after you have had chance to receive our legal advice and ask any questions you wish. To ensure we can comply with UK regulatory requirements we would ask that you bring your original passport and original identity documents with you to the meeting, so that we can view these on screen. You should also ensure that a good quality certified copy of your passport, identity document along with proof of your address of residence, and proof of the source of the funds to be used in the transaction, such as a bank statement or similar, is scanned to us. For transactions of particularly high value, or where there is a large group of clients who require advice, it may be possible for your international property investment solicitor to travel to meet you in your home country. We have recently, for example, travelled to Bangkok, Thailand, and to Taipei, Taiwan, to meet valued clients there. Our principal value is that it is our job to protect you, the client. We are independent of the developers and their solicitors, and will protect and serve your interests. If there is something to be unsure about, we will advise you so that you can make an informed decision (of course this extends only to matters of law – we are unable to advise you on whether your proposed investment is suitable, and we do not provide tax, accountancy or property condition and surveyor advice – on these matters we are happy to introduce you to suitably qualified independent professionals). We know that you want this transaction to be as straightforward as possible. Where we are able to, we will work with developers in advance to ensure we understand the developments proposed and can advise on the legal issues quickly. We work efficiently. In most cases, if the developer’s solicitors co-operate, we are able to proceed to exchange of contracts within 21 days of booking, or less. We understand different time zones and language needs. We will schedule meetings at the time which works best for you, and if you need an interpreter we will arrange that too at no additional cost.